Hagen and Hyde pub has a great selection of drinks including ten real ales, twelve keg beers, ciders and a varied choice of cocktails. The kitchen at Hagen and Hyde specialises in all things seasonally British as well as some much loved classics. 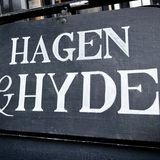 Do you work at Hagen and Hyde? Patio garden and a restaurant terrace for outside dining. What did you think of Hagen and Hyde? The fact that it is open means that the council obviously think it is safe! You're missing the point of everything, this is a great bar, it is a breath of fresh air in Balham for the drinking scene and the food is of top quality! I suggest everybody takes a look at it for it's merits, rather than the cold hearted opinion of someone who has missed the point in life. I have now been back for a pint an dthis is much better, more room and even seats at the bar :-)!! Didn't have food but I do hope the tin plates are gone. Things are looking up. Although not sure about the pianos. WIll there be a place to watch some rugby?? I do not quite understand how everyone seems to be overlooking the fact that this pub is trading whilst it is obviously not completed! Holes in walls open parts of ceiling wiring hanging out just for starters the back yard looks like a recycle centre full of rubbish, it is disgusting! But more disgusting is how the local council have let this happen. 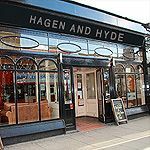 Having just moved to Balham and seeing the constant Hagenandhyde postings on twitter I decided to visit! I have to say after reading the review on this site, I wasn't expecting a lot. However.. This is a real gem. I asked at the bar about food where I was taken up stairs by a lady (manager I think) where I waited for my partner. The room was half full and had a lovely atmosphere. To drink I had a French Martini ( I love these) I have to say it was the best I've tasted in a long while. This did take me by surprise as when you walk in its beer beer beer!at least 12 bitters I think. I finished this, and my boyfriend arrived I ordered another and he had a Vanilla & Tobacco infused Old Fashioned, (possibly the best old Fashioned he'd ever had) By this time we are excited! Food? Amazing... I ordered The Deep fried poached egg and beets, delish! and Barry had the cured Salmon. We did wait a while but the kitchen was on full steam and we didn't mind waiting. For Mains we shared the fish pie! Dear god, its a must, cheap and full to the brim with creatures from the deep! 10/10 all around! However.. The tables and chairs?? Whats going on? Come on.. With the drinks and food at this standard they should meet half way at least with the fixtures and fittings. Staff great everything great.. A must visit! Nice staff when we went, but cold atmosphere and not enough space to have a simple pint. No TV's so sport not available. Food upsatirs: Room made up of old furniture (a bit too cheap looking but this may be the look they want)and presented on tin plates and coffee served in tin cups - not really a winner and this needs to change. Food taseful though but wouldn't go back for just a drink as there isn't the room or atmosphere.